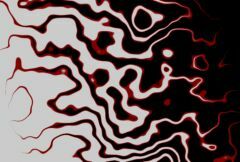 Performs a wipe transition between two input clips using a plasma texture with moving tendrils. The Wipe Percent parameter should be animated to control the transition speed. Increase the Grad Add parameter to make the timing of the plasma pattern move across the screen during the wipe. Increase the Border Width parameter to draw a border at the wipe transition edges. Frequency: Default: 4, Range: 0.05 or greater. The frequency of the plasma pattern. Increase for more and smaller elements, or decrease for fewer and larger. Octaves: Integer, Default: 4, Range: 1 to 10. Seed: Default: 0.12, Range: 0 or greater. Plasma Grad: Default: 0, Range: 0 or greater. The amplitude of a gradient which aligns the plasma tendrils. Increase for a more zebra-like striped effect. Plasma Grad Angle: Default: 0, Range: any. Orients the gradient of the plasma lines. This only has an affect if the Plasma Grad parameter is positive. Layers: Default: 8, Range: 0 or greater. Translation of the plasma pattern. Phase Speed: Default: 2, Range: any. Grad Add: Default: 0.5, Range: -10 to 10. The direction of the wipe gradient in degrees. This will have no effect unless Grad Add is positive. The Wipe Widget also allows adjusting this parameter. Turns on or off the screen user interface widget for adjusting the Grad Add, Grad Angle, and Wipe Percent parameters. The value of the Grad Add parameter must first be positive for this widget to be visible.This parameter only appears on AE and Premiere, where on-screen widgets are supported.